Living in our world, where everyone is constantly connected, it is necessary to unplug from the virtual world of distraction. Yet, one's escape is unique to every individual. To some, climbing, hiking, or camping provides the chance to step back and think. To me, however, escape is found swaying side to side on the beautiful water. Each Spring the Tufts Sailing Team ventures out into nature for our training trip, away from our comfort and into a world different from our own. While the campsite has changed a few times over the years, the tradition remains fundamentally the same; every year, the Tufts' Jumbos spend a week sailing and camping together, preparing for the height of our looming Spring season. Other sailing teams think we’re crazy. March on the Mid-Atlantic coast can be cold, snowy and miserable, but most of us have a fondness for our foray into the semi-wilderness of St. Mary’s County, Maryland. It gives us all a chance to disconnect from technology, homework, and all the distractions that college life offers and connect face-to-face with the brothers and sisters we have as teammates. When we arrive in the county on Sunday evening, it’s time to setup camp. Naming our tents and our vans, we claim the perfect spots around the site. While some prefer to sleep right around the fire, others push farther, liking to have a little distance. And of course, we stake our claim by raising the Tufts flag. Day-to-day life on Spring Break is wedded to a routine. The day starts early so that we can get to the water and start sailing on the river, surrounded on either side by the ominous greens and the crisp, blue sky. Coach Ken gets up and cooks breakfast for the team, until the smell of food slowly draws us all out of our tents. After we get off the water following the day’s practice we chop wood, cook dinner, and gather around the fire instead of holing up in individual hotel rooms. Camp upkeep is work, yes, but to me it is a social time. Preparing dinner or building a fire with my team gives me a chance to know them in a way that goes far beyond practices and life back in the comfort of campus. Some argue that we would train harder and improve faster if we had the comforts of a hotel room to retire to after practice, but Ken will tell you that after the inception of our tradition in the 90s, Tufts Sailing saw some of its most successful years. There is no better way to bond with your teammates than to huddle together around the fire, contently exposed to the vast, mysterious land around us. 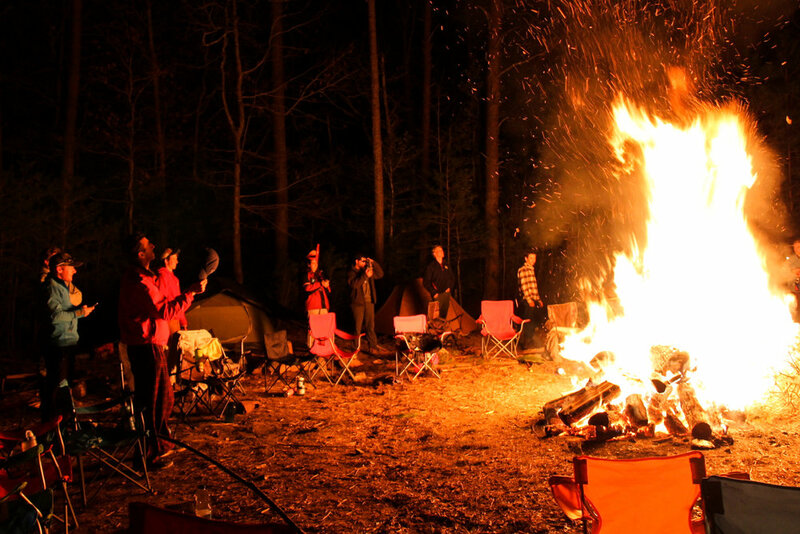 Enjoyment grows, as each Spring Break attendee is required to provide five minutes of campfire entertainment. This can be virtually anything, from games, to songs, to balloon animal art. We’ve really seen it all! Before I found the sailing team, I was decidedly a city girl. And while my core will always be LA-inspired, I like to think that Spring Break, and sailing in general, have taught me that often nature is the best place to go to figure the most complicated of things out. I came back from this year’s trip with a very clear idea of what I wanted out of my last few months of senior year. Let everyone else party in the Bahamas or Florida, I figured. Caroline is a senior at Tufts University. While she love to spend her free time sailing, even just being the water makes her happiest.